May 31, 2017 May 31, 2017 / J.K.
Level – Fairly easy, short to moderate length. A book about how to be a disciple written by someone who apparently isn’t very good at it. As usual, I don’t have a very good summary of what this book is about. The best summary of the books is right there as the subtitle – grace for people who can’t get their act together. I don’t know how to add to that. There are 10 chapters (20ish pages each) with a short introduction and even shorter conclusion. 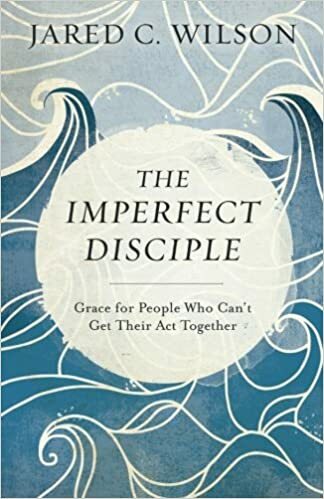 This is what a book about discipleship should be. This might be the best book I’ve read this year, certainly the best ‘Christian’ book of the year, probably the best in a while. I was given a copy of this book to review, but I may actually go buy a few more to hand out. So, what makes it so good? Was there anything revolutionary in this book for me? Honestly, no. There was almost nothing new and different for me, other than a growing jealously of his writing style. Why would I want more copies of this book then? Because it is the best book to give out to people who ‘try’ hard to be ‘good’. I resonated deeply with his background, in the fundamentalist/moralistic sects of the baptist world. It probably took me until my 20’s to really understand Grace and the Gospel. To his subtitle, I already know I don’t have together and never will, and understand that this is the need for grace. However, there are so many people who don’t yet know this. Wilson is a master at saying what needs to be said in a way that will be heard by those who need to hear. He writes with the obliviously well worn heart of a pastor who has seen people burn themselves out or tear themselves down. Buy this book for a new believer. Buy this book for the old believer you know who is always trying to ‘be’ better and is confused as to why they can’t. Buy this book if you disciple anyone, or lead any small group. Buy this book if you work with youth or college students. Buy this book for anyone new to the Biblical concept of Grace. Finally, go ahead and get if for yourself. It is a fun, enlightening read. I just pulled up amazon and it is less than $9. Admit it to yourself, that is less than you spent last time you went to one of those weight your ice cream places. I rarely ever hold pages, or underline/make notes in non-academic books (things other than commentaries or systematics), but I just flipped back through this and found 15 dogeared pages. Maybe the most surprising is how broad they are, everything from what it means to be a disciple with examples from Isaiah, to issues with American Christianity and consumerism, to depression and struggling with your faith, and coincidentally to me as I am studying this right now – some good teaching from the Sermon on the Mount. This book really is a go to book for what it means to be a disciple and a must read for anyone interested in the topic of being a follower of Jesus. The depth of the theology and pastoral messaging was incredible, while at the same time the book was funny and honest. He writes the way a non-pretend theologian blogger would write if he were to write a book. Great review man. I just picked up the book on Amazon. I keep hoping that when I finally get a chance to visit campus I’ll run in to Jared, but I know odds are I probably won’t. Lol Hope you’re doing well! Thanks, it really is a solid book. I actually follow him on twitter, but am not entirely sure what he does at Mid-Western. Doing pretty well. Still don’t really know what I’m doing. How did your first year go? I think he does something in the realm of strategy for Midwestern?? I tried to find his page on their site and couldn’t find him, but it goes something along those lines. Glad to hear you’re at least trying to figure out what you’re doing. I’ve already changed majors from the MDiv with a Counseling emphasis to a straight Counseling degree. The MDiv was 96 hours and the Counseling was 60. You do the math and tell me which one is cheaper. Lol The first year has been interesting. Hermeneutics was pretty easy, but my Old Testament Survey class was TOUGH, though I’m happy to report that I scraped an A in it. But definitely not easy! I took two courses through CCEF in prep for enrolling in Westminster’s program. Cost was definitely a factor. Recently, though, I’m not sure I’m going to keep going with it. Hopefully, I’ll have more info up on the blog later, but I feel like I’m back to square one, where I was a year ago, but I guess less confused. Yeah. Anyway, glad things are going well for you man.